Relished as much for the invigorating variety of exhibitions as for the parties that accompany them, Photomonth is a must for all photography enthusiasts, arty young adventurers, and seasoned fellows on the hunt for talent of varying sorts. Expect exhibitions on all subjects, but this year’s special theme is “Memory Processed,” which will explore the explosive world of archives, and the tangled webs of Soviet secret police. As always, honoured guests from a specific country will also be in the spotlight – this year Czech photographers step up. To find out more about this year’s edition, the Krakow Post spoke with Karol Hordziej, artistic director of the Photomonth Festival. KP: The festival is only in its 7th year, yet it has become very popular within Poland and is recognised internationally. Why do you think that is? KH: I think that’s plenty of time – enough time for the festival to become recognised and for people to get excited about the following year’s edition. Particularly after last year, when the festival had such high attendance and so much promotion and media attention. Last year was definitely a breakthrough for the festival. Practically everything we were working on was noticed and appreciated – everything worked as it was supposed to. As for the international aspect of it, we have the good luck of being in the right place at the right time. Krakow in May is the perfect space-time location – the climate is ideal and people come for that too. Also, in the West [festivals] can get a bit repetitive. You can predict what you will see, as there is more money, and the “best” photographers are usually chosen. But the sphere of the best artists is limited and sometimes there is no point in travelling to see such a big festival abroad, because you open the catalogue and think, “oh, great, it’s all the big names, the stars” – but it’s all things you know already. Here, we try to have a balance. We don’t depend on the “stars,” but rather try to discover new people, and I think that’s one reason behind our popularity – you can still be surprised here. KP: Do you have any big names this year? KH: This year we do have one star, WeeGee. But even then, we’re trying to present something different from him. For instance, the Hendrik Berinson collection – these are pictures he’d been collecting for 20 years – so one can say that Berinson is like a curator who has been preparing an exhibition for 20 years. That’s part of the “Memory Transformed” theme of this year’s festival. The festival can be divided into two parts: “Memory Processed” and Czech photography. WeeGee is the “star” of the former, and from the latter we have Viktor Kolář, who’s not exactly a star, but he serves the same function that Zofia Rydet served last year for Poland. Basically, professionals know that she is very important in Polish photography, but she hasn’t had a proper exhibition, or a proper album, and Viktor Kolář is such a figure this year. 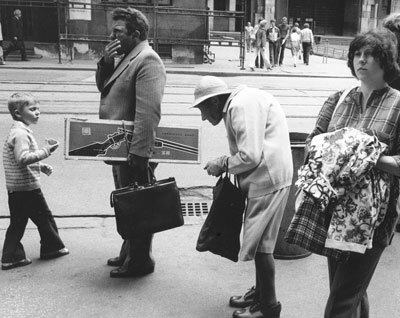 He has done amazing work since the 1960s; for 40 years he’s been photographing Ostrava. But it turns out that he hasn’t had a solo exhibition in his own country for 10 years. So we’re very happy we were able to convince him to do a retrospective exhibition, which will actually open the festival. KP: Coming back to the “Memory Processed” theme – what exactly does that entail? KH: First of all, one can read this on several levels. One part is that these are archives in the imaginations of these eminent artists. On the other hand, there is the literal sense of actually digging through these institutional archives. WeeGee is someone who to us formed an archive of the city; he looked for specific things, and when walking into his exhibition it’s almost like walking into an archive of the dark side of New York City. Yamamoto, meanwhile, creates an archive of his imagination. Then there’s the main collection, which is called the “Central Archive,” which will be displayed in the former Erdal Factory, and that’s a literal digging through of several archives, as well as private collections. KP: Will these primarily be things that have not previously been displayed? KH: It’s about half and half; half have never been exhibited, and half have, but in a limited sense. Perhaps some pictures have been shown once in a biennial in Moscow or something like that, but there’s nothing that’s been around the world or even Europe. KP: Previous editions of the festival have taken place in some very interesting places: Schindler’s factory, a brewery, and so on. Anything like that planned for this year? KH: This year the former Erdal Factory is such a place. It’s a factory that we took over in a completely raw state, and at the moment we’re building walls and changing the architecture inside. It’s a place to be discovered; it’s so close to the centre but no one goes there. There will be 12 exhibitions in one place in a kind of labyrinth arranged by us. KP: What about the OFF program? How does that relate to the main parts of Photomonth? KH: Off is like a separate festival within the main festival. This year, the selection happened through MySpace; we invited an international jury, and they picked the exhibitions. While the festival’s main programme is structured around a central theme, based on which we invite the artists who will participate, the Off programme is exactly the opposite. The artists send in their proposals, and there is no theme, so it’s strictly about this openness to a variety of themes. KP: And where can we see the Off exhibitions? KH: Those will be all over the city, in smaller galleries and cafes. Full programmes can be found online at www.photomonth.com and in the cultural office at ul. św. Jana 2.